Immigration control has become a fundamental project in contemporary Britain especially in relation to the incapacity of the welfare state to absorb large numbers of poor immigrants coming from all over the globe. However, as Bridget Anderson has argued in her book ‘Us and Them: the Dangerous Politics of Immigration Controls’, immigration control, as a contemporary matter has its historical roots which are deeply embedded in the ancient English community’s attempt to exercise control over the mobility of the unsettled poor of the parish. Indeed, the English poor laws, beginning with the Vagrancy and Statutes of Labourers, proceeding to the Elizabethan laws of the sixteenth century and the subsequent reforms of the eighteenth century had their main focus at regulating and controlling the mobility of poor people. Notwithstanding the fact that mobility was a fundamental characteristic of the time, it was the connection between endemic mobility and chronic poverty (associated with these movements) which precipitated the enactment of laws that obliged local parishes to only assume responsibility over their own home-grown poor. In this context, internal migrants posed local authorities with problems associated with population turnover and significantly threatened the social, economic and political order of the entire empire. These are the same challenges that contemporary migration regimes are battling with in the context of international migration. In contemporary Britain, like the case in other liberal democracies, responding to global mass movements of uninvited people has involved devising both border and internal control mechanisms to step up enforcement. In the same way ancient parishes experimented with different apparatus to help distinguish between the ‘deserving’ and the ‘undeserving’ poor, contemporary legislation has progressively focused at categorizing between desirable and undesirable mobility, with more emphasis being put on attracting the ‘Brightest and the Best’ or simply those with the financial resources to invest and skills to contribute to the British economy. In this process, the rights of migrants are being redefined to emphasize economic benefits and legal status; the absence of which is subtly presented as a threat, and increasingly as a serious crime, sometimes, even with implications for both national security and community integration and cohesion. More generally, and increasingly in political debates, admitting immigrants is portrayed as a favour exercised by a generous immigration regime which at the same time has the discretionary powers to withdraw this privilege at any point. The deepening and expansion of the immigration enforcement regime is clearly evidenced by recent initiatives. 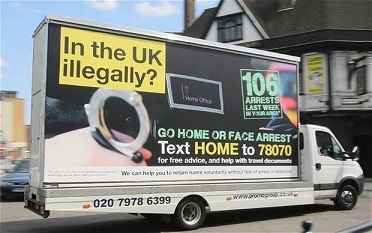 The 2013 summer Home Office’s ‘Go Home’ immigration vans campaign, premised on both the idea of involving local communities in the search and removal of illegal migrants and promoting voluntary departure schemes to those who have no right to be in the UK is one case in point. However, in the face of a claim for an evidence-based immigration system, the now banned ‘Go Home Van Poster Campaign’ has attracted widespread criticisms which have the potential to open up new debates about evidence and public engagement. Besides the campaign being rated as ‘shameful’, ‘offensive’ and ‘racist’ the Home Office has increasingly been criticised for creating public attitudes to immigration by using misleading ‘evidence’ in relation to both arrest statistics and the wider impact of the campaign and related initiatives (Mark Sweney). Moreover the Home Office was also blamed for its failure to consult with the local authorities before embarking on the campaign (Rowena-mason). This raises questions not only about the nature of evidence the government relies on but also with regards to how immigration problems are defined in the context of a government that sets itself up as relying on evidence in order to increase transparency in immigration policymaking and build public trust in immigration issues. The increasingly hostile environment towards immigrants is also evidenced by the existence of the new immigration bill ‘Creating a ‘hostile environment’ for migrants’ currently being debated in parliament. Precisely, the bill’s main thrust is that of pushing towards a ‘localized enforcement regime’ by obliging street-level bureaucrats such as health practitioners, landlords and many other local actors to use their contacts with local residents to detect, extricate the ‘undeserving’ migrants and collaborate in their removal. The authors Roda Madziva, Vivien Lowndes and Saul Becker are engaging with the matter of what counts as (authentic) evidence in immigration as well as investigating how evidence is generated, shared and deliberated between politicians, street-level bureaucrats and the public as part of a 5 year University of Nottingham led research programme: ‘Making Science Public’, funded by the Leverhulme Programme.